Susanne Lewest is a French-German painter who formed her art into perfect dots with her extraordinary artistic instinct and the skill of the crafts-woman. Starting out as a milliner and creating hats for glamorous ladies in Paris, France she soon realised that her creativity demanded a more free-spirited approach. So she took up painting while still making hats for a living. The turning point came in 2006 while residing in Singapore. „Having to sell my hats in order to prove myself as an artist really affected my creativity“, she says. Today, clandestine reminders of Susanne Lewest’s past as a milliner can still be found in her poetically composed paintings filled with movement, poise and imagination. Susanne’s paintings speak their own bold and luminous language, written „dot by dot“… a language she hopes to be within everyone’s reach. « By combining colour with texture in dots, time and place are over come and lost moments resurrected ». The results are visually intriguing works which are at the same time organic and abstract. Susanne Lewest was born in Berlin West inGermany, where she grew up and studied fashion design. She moved to Paris in 1989 and started a carrier as a milliner. At the same time she developed a strong interest in painting. Susanne created her custom made hats under her own label which she took with her when the family relocated to Ireland and then Singapore. It was in Singapore in 2006 that she finally decided to invest herself fully in painting. She does not only paint, but also creates outdoor art, making the natural environment part of her art pieces. Susanne returned to France in 2009, where she lives with her family and works from her own studio. 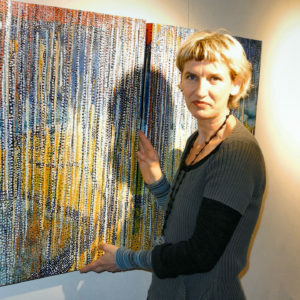 Susanne Lewest has exhibited her work in galleries in France, Singapore and Germany.